Originally released two decades after the debut transmission of the cult spy-fi series The Prisoner, this officially authorised sequel is now itself something of a vintage classic, as the four-issue mini-series from DC Comics concluded 30 years ago. I hadn’t read the story until this welcome reprint came along. In my review of the more recent follow-up, The Uncertainty Machine, I complained that it took 20 pages to transport its hero, Breen, to the Village, compared with the opening instalment of the television series, which arrived at the detention centre within a few minutes. It turns out that Shattered Visage takes even longer to get there, with its heroine, the retired spy Alice Drake, waking up on the shores of the nearly deserted facility a whopping 34 pages into Dean Motter (Mister X, Grendel: Red, White and Black, Batman: Black & White) and Mark Askwith’s (Batman, Justice League International) tale. I found those opening pages hard to get into, because I just wanted to get to the Village. However, there is some interesting visual foreshadowing of the place during the first chapter, A(r)rival. The doorways in Alice’s flat resemble those of the Village, and bars are a recurring visual motif. Incidentally, the exterior of the flat resembles the location used for Number Six’s home, 1 Buckingham Place, while Alice’s estranged husband Thomas, himself a secret service operative, drives a Lotus Seven that is identical to the one used in the series, even down to the licence plate KAR 120C. It looks as though they acquired Six’s abandoned possessions a la Many Happy Returns. The second and third chapters, By Hook or By Crook and Confrontation, are dominated by the heroine’s interactions with Number Six, who has stayed in the Village for reasons of his own, and eventually Number Two, who has recently returned to the place. As in The Uncertainty Machine, we learn a great deal about the new resident. In complete contrast to the original prisoner, whose identity and motivation for resigning remained an almost complete mystery throughout his 17 episodes, Alice Drake (whose surname she shares with an earlier Patrick McGoohan character, from the series Danger Man) proves to be anything but tight-lipped. While Number Six shows her around the Village, she happily babbles away about the circumstances that led to her being shipwrecked, including the breakdown of her marriage and her reasons for quitting her job. The enigmatic Six, meanwhile, behaves more like someone in the role of Number Two when we first meet him, telling Ms Drake that she is Number Six, and interrogating her with apparently innocuous questions while deflecting her queries with his own cryptic responses. 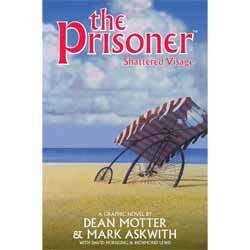 Many Prisoner fans have questioned why he alone remained in the Village when everyone else was “free to go” – but he always was a contrary fellow, wasn’t he, and his scenes are undoubtedly the highlights of the book. Disappointingly, Alice and Six are largely absent from the final chapter, Departure, as other plot strands take over, though there is a tangible ramping up of the dramatic tension and a literally explosive climax. Dean Motter’s art is often rather sketchy (his likenesses vary, and sometimes it is difficult to tell what is actually going on) but occasionally spectacular. Meanwhile, David Hornung and Richmond Lewis’s colours are frequently surreal, with, for example, a yellow Thomas conversing with his orange American contact (no, it’s not Donald Trump), and some panels not coloured in at all. This is not simply to do with the comic’s age. I know that production techniques have improved enormously over the decades, but other prestige titles from a similar period, most notably The Dark Knight Returns, managed to have much more detailed and subtle colouring. A five-page text-based prologue has appeared in all versions of the graphic novel to date, including this one, having apparently been added in order to clarify the authors’ interpretation of the controversial final episode Fall Out (in which Number Six appeared to make peace with Number Two and escaped from the Village). However, you will find that this is, in fact, explained within the strip, if you look hard enough. The prologue also makes it clearer who wrote the Spycatcher-like exposé The Village Idiot – which, I admit, did aid my understanding. This edition also includes a new foreword by Abigail McKern, the daughter of Leo McKern (alias Number Two), a new afterword by Dean Motter, character sketches, a promotional flier that I vividly remember being intrigued by back in 1988, and the covers to the monthly comic books. However, the cover of the 1990 graphic novel is not presented here, which is a pity, as I prefer it to the modified artwork used for this collection (on which the original montage of faces has been replaced by clouds). Ultimately, Shattered Visage raises as many questions as it answers, and the way in which it builds upon previous episodes will not be to everyone’s liking. However, you could say the same thing about the parent show, which tended to go out of its way not to provide any straight answers and was far from entirely consistent. In common with many episodes of The Prisoner, Motter and Askwith’s narrative can make for a frustrating first encounter, but giving it a second (or third, or more) look can yield additional insights. I don’t doubt that I’ll be seeing it again some time.